The Biomedical Engineering (BME) Capstone Design course at Georgia Institute of Technology is an opportunity for students from diverse realms of engineering to design, build, and test prototypes with real world applications. This culminates into the Senior Design Expo, in which students pitch the invention and marketability of their product, competing with their peers for top prizes. 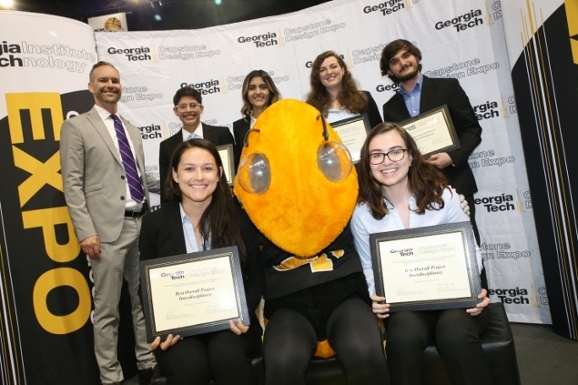 Many projects will become successful IP (intellectual property) in the corporate world or will go on to life-changing research – but it would never happen without the support given to students at Georgia Tech through a collaboration with ACTSI. The process of senior design and breathing life into an idea has been one of the most interesting experiences of these students’ lives. The spring 2016 Expo’s Best Overall Winner was Hub Hygiene, sponsored by W. Jud Ready at Georgia Tech Research Institute (GTRI). The team aims to reduce Central Line Associated Bloodstream Infection (CLABSI) rates. Members Pranav Godbole, Mechanical Engineering (ME), Ruifu Shi, BME, Bharathwaj Nandagopal, BME, Timothy Gassner, BME, You Keun Kim, BME, and Mary Catherine Adams, Materials Science and Engineering (MSE), invented a disinfecting scrub that tells the user when the needleless IV connector (catheter hub) is being correctly cleaned. The team’s original problem came from Tracy Frisbee, the Clinical Operations Director at Duke Children's Hospital, who noticed a need for an improved cleaning device. Central lines are used to inject medication or draw blood from critically ill patients in ICUs. They are inserted into a major vein near the heart and can remain in place for weeks or even months. If the hubs of the catheters are not kept clean, germs and viruses can enter the bloodstream through the central line. The maintenance of this hub is crucial to the health of the critically ill patient. CLABSI’s are a prevalent issue in healthcare with an estimated 40,000 occurring in U.S. intensive care units (ICU) annually, with a mortality rate of 10-40%. These infections can increase the average stay of patients to seven to ten days, costing hospitals roughly $45,000 per infection. Currently, hospitals follow the “Scrub the Hub!” protocol, provided by the Centers for Disease Control (CDC). This protocol involves scrubbing the hub of the central line for 15 seconds, and letting it air dry for another 45 seconds. Unfortunately, the hub has tiny threads that are hard to clean between. Because of the amount of time, effort, and the inability to verify disinfection, this protocol is often not performed properly allowing for germs to grow. Hub Hygiene is reinventing the cleaning method intuitively, effectively, and cost efficiently. Their solution adds no changes to infrastructure and training, following the Scrub the Hub! protocol while simultaneously employing a unique surface-conformant that can clean the hub’s threads. The user is audibly cued by a sound when the correct amount of pressure has been applied to the device, indicating they are cleaning hubs properly. Hub Hygiene showcased their innovation at Molecules for Minions, a southeastern pediatric research conference hosted by the Pediatric Research Alliance, as well as the International Society of Pediatric Innovation in Atlanta. Most recently, the team presented at the Materials Research Society. Brain arteriovenous malformations (AVMs) are tangles of abnormal blood vessels connecting the arteries and veins in the brain. The arteries take the oxygen-rich blood from the heart to the brain, while veins transport oxygen-depleted blood back to the lungs and heart. This disease disrupts this vital process, most often in the brain and spine, where a direct connection is then created between the veins and arteries. When the AVMend team was selected for this project by Children’s Healthcare of Atlanta and began researching and understanding the profound impact this disease has on children, they knew they had chosen the right project. The team, comprised of Katie Neuberger, BME, Emily Evans, BME, Paige Holbrook, BME, and Alex Warner, BME, devised a novel approach to addressing this issue with their Partitioned Drug Delivery Catheter. This device allows for a safer and more effective drug delivery system when treating those with AVMs. The catheter is inserted into the affected blood vessel and the sheath is then removed, revealing two cone-like flaps that close and stop blood flow. Once the flaps are deployed, a drug can be delivered through a catheter that will only remain between those flaps. This allows for an increase in contact time for the drug, so a less toxic and safer drug can be used. Though this device was created with AVMs in minds, its clinical application extends to any setting where blood flow needs to be stopped to allow for a longer contact time with a drug. Taking the top spot in Capstone’s Interdisciplinary teams was Team Infinitis, comprised of Taylor Armstead, MSE, Emilie Kundycki, MSE, Emily David, BME, Soleil Schatteman, ME, John Papayanopoulous, ME, as well as Shirin Kale, BME. The team made a revolutionary development in women’s reproductive health, creating a more appealing IUD for both doctors and patients while still reducing pregnancy by 99%. IUDs are a highly effective, longer-lasting, reversible form of birth control for women that want to preserve their fertility while preventing pregnancy. Currently, nearly 50% of all pregnancies in the U.S. are unplanned. Of those, 50% of the unplanned pregnancies occurred while the female was on birth control – meaning 25% of all pregnancies in the U.S. are both unplanned and occur as a result of birth control failure. How does this happen? Over 60% of women use the birth control pill, which typically has a ~9% failure rate under typical use. Essentially this means that the pill (99% effective under proper use) allows for high user error, which decreases its effectiveness to 91%. Meanwhile, the IUD eliminates the use of user error completely, having a failure rate of <1% under proper and typical use. So, Kale wondered, why aren’t more women using IUDS? Only 3% of women in the U.S. use this birth control, most of whom have had children and are over the age of 35. When the team looked back at the 50% of all pregnancies being unplanned, they found that 70% of those pregnancies came from women under age 30, mostly women who have not had children, (therefore having a smaller cervix). All were not ideal candidates for the IUD insertion procedure. “Prior to collaborating with the rest of my team,” Shirin said, “the inspiration behind this idea was incredibly personal for me.” Shirin, like many women in this country, found their contraceptive options incredibly limiting. Drawbacks like high failure rate, physiological imbalances causing mood swings, inconvenience, and pain are just some of the many risks women must consider. This IUD is made from a copper-aluminum (Cu-Al) shape memory alloy, a thin and flexible material that allows for a much smoother transition upon insertion. This also allowed the team to reduce the cervical insertion diameter by 40% compared to current IUDs, thereby reducing pain and risk of perforation. These shape memory alloy (SMAs) are also thermally triggered materials – meaning they can also be “trained” to take any shape by exposing the shape of the material to extremely high temperatures. The team first trained the Cu-Al SMA to make an infinity shape such that upon reaching body temperature, the Cu-Al SMA opens and configures itself into an infinity shape. Current IUD insertion require the doctor to use a dilator to dilate and then measure the cervix, commonly described as the most painful steps of the procedure. Infinitis eliminates these steps, no dilation or measurement required. The two halves of the device open in the uterus upon insertion, coming to a gentle resting position at the base of the uterus, with the strings from the intersection point coming our through the cervix. This project had implications much larger than anyone could ever expect, especially Shirin’s. “It has the potential to enhance the field of women’s reproductive health, but it also has social and economic implications. Having become emotionally invested in my project, I am very proud of my team and our incredibly well-designed device,” said Shirin. They currently have two patents pending.